Click-&-Go™ Plus Protein Enrichment Kit is an efficient tool for capture of alkyne-modified proteins on picolyl azide-agarose resin. The alkyne-modified proteins, or their post-translationally modified forms, are captured from complex protein extracts on the picolyl azide-agarose resin supplied. Once covalently attached to the resin via copper catalyzed click chemistry, beads can be washed with highest stringency virtually eliminating any non-specifically bound proteins to yield a highly enriched population of nascent molecules. Upon protease digestion, this yields a highly pure peptide pool that is ideal for mass spectrometry (e.g., LC MS/MS) based analysis. 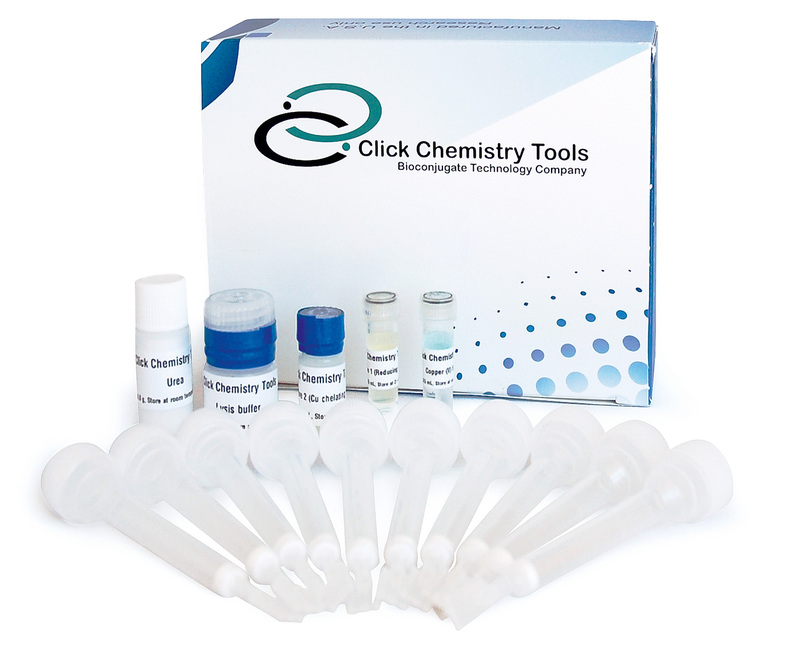 Click-&-Go™ Protein Enrichment Kit is an efficient tool for capture of alkyne-modified proteins on picolyl azide-agarose resin. picolyl azide moiety is an unique azide that incorporates a copper-chelating motif to raise the effective concentration of Cu(I) at the reaction site. The incorporation of copper chelating moiety into azide reports is the latest step in improving kinetics of CuAAC, which in turn leads to a substantial increase in the sensitivity of alkyne detection. This is of special value for the detection of low abundance targets or where several increase of signal intensity is desired. The alkyne modification can occur via metabolic feeding, enzymatic addition, or chemical modification. The alkyne-modified proteins, or their post-translationally modified forms, are captured from complex protein extracts on the azide-agarose resin supplied. Once covalently attached to the resin via copper catalyzed click chemistry, beads can be washed with highest stringency virtually eliminating any non-specifically bound proteins to yield a highly enriched population of nascent molecules. Upon protease digestion, this yields a highly pure peptide pool that is ideal for mass spectrometry (e.g., LC MS/MS) based analysis.